Shorten pledged to give bigger income tax cuts for 10 million taxpayers. Opposition leader Bill Shorten has launched a tax bidding war, promising to top the government’s tax relief for lower and middle income earners, as he prepares to fight a string of byelections in Labor seats. The Labor alternative almost doubles the budget’s relief for these taxpayers, incorporating the early part of the government’s plan and then building on it. Delivering his budget reply in Parliament on Thursday night, Shorten pledged to give bigger income tax cuts for 10 million taxpayers. Some four million would get A$398 a year more than the $530 under the government’s plan. Labor’s “Working Australians Tax Refund”, would cost $5.8 billion more than the government’s plan over the forward estimates. Labor’s alternative comes as debate intensifies about the latter stage of the government’s plan, when a flattening of the tax scale would give substantial benefit to high income earners. The ALP hardened its position against that change as modelling cast doubt on its fairness. The opposition launched a Senate inquiry which will report mid June on the tax legislation, introduced into parliament on Wednesday. The government says it will not split the bill, which it wants through before parliament rises for its winter break, but will be under pressure to do so including from the crossbench. Under Shorten’s proposal, the ALP would support the government’s budget tax cut in 2018-19. Once in power, it would then deliver bigger tax cuts from July 1 2019, when it began the refund. In Labor’s first budget “we will deliver a bigger better and fairer tax cut for 10 million working Australians. Almost double what the government offered on Tuesday”, Shorten told parliament. The Labor plan would give all taxpayers earning under $125,000 a year a larger tax cut than they would get under the budget plan. In a speech heavy on the theme of fairness, Shorten said: “At the next election there will be a very clear choice on tax. Ten million Australians will pay less tax under Labor”. He also pitched his budget reply directly at the campaign for the byelections. “This is my challenge to the Prime Minister. If you think that your budget is fair, if you think that your sneaky cuts can survive scrutiny, put it to the test. Put it to the test in Burnie, put it to the test in Fremantle and in Perth. In the Labor model, a teacher earning $65,000 would get tax relief of $928 a year, $398 more than the $530 offered by the government. A married couple, with one partner earning $90,000 and the other $50,000 would receive a tax cut of $1855, making them $796 a year better off under Labor than under the government. Shorten said Labor could afford the tax cuts it proposed because it wasn’t giving $80 billion to big business and the big four banks. Also, it had earlier made hard choices on revenue measures. An ALP government could deliver “the winning trifecta” – “a genuine tax cut for middle and working class Australians; proper funding for schools, hospitals and the safety net; and paying back more of Australia’s national debt faster”. Shorten said that the Liberals were proposing to radically rewrite the tax rules in their seven year plan. Research had revealed that $6 in every $10 would go to the wealthiest 20% of Australians, he said . “Very quickly, this is starting to look like a Mates Rates tax plan”. “And at a time of flat wages, rising inequality and a growing sense of unfairness in the community”. · A plan for skills, TAFE and apprentices costing $473 million over the forward estimates. · Abolition of the cap on university places, re-instating Labor’s demand driven system, at a cost of $140 million over the forward estimates. · Reversing cuts to hospitals and establishing a Better Hospitals Fund, seeing an extra $2.8 billion flow to public hospitals. This would cost $764 million over the budget period. · Invest $80 million to boost the number of eligible MRI machines and approve 20 new licences – which would mean 500,000 more scans funded by Medicare over the course of a first Labor budget. · Provide $25m to the Commonwealth Public Prosecutor to establish a Corporate Crime Taskforce. The Taskforce would deal with recommendations for criminal prosecution from the banking royal commission. Bill Shorten arrives to deliver the budget reply speech. Opposition Leader Bill Shorten has said Labor will oppose the budget’s increase in the Medicare levy hitting taxpayers on incomes under A$87,000. And he has flagged a Labor government would reimpose the deficit levy on high-income earners, that automatically expires on June 30. “Labor will not support spending $19.4 billion on the wealthiest 2% of Australians,” he said in his budget reply on Thursday night. Labor says that a combination of the pared back levy rise and the deficit levy would deliver an extra $4.5 billion over ten years “without putting the burden onto families earning modest incomes”. The combination would mean that, under Labor’s proposal, those on incomes of more than $180,000 would pay a 49.5% marginal tax rate. 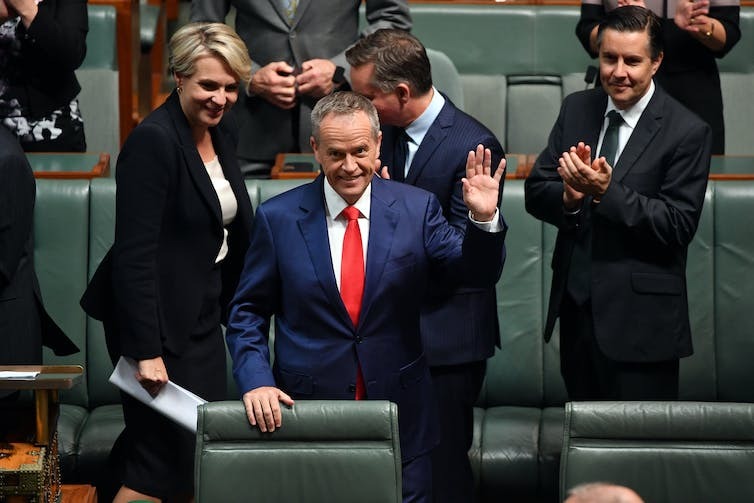 After the opposition hedged its position last week, Shorten has confirmed a Labor government would put an extra $22 billion into schools above the amount the government has pledged, going back to the original ALP plan. 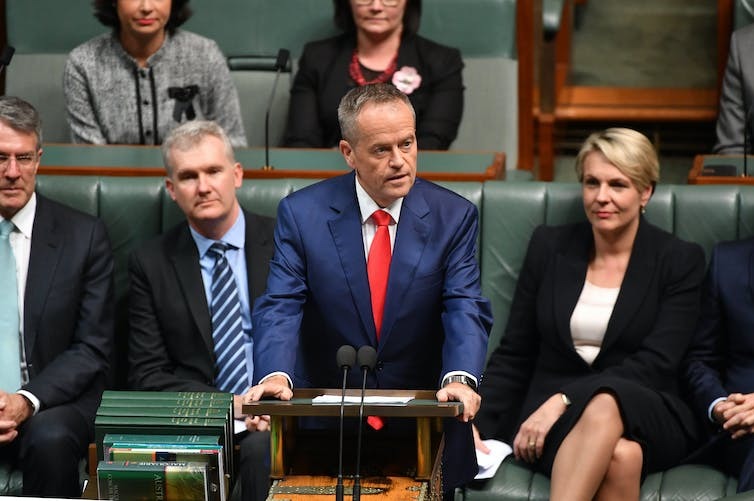 In an extensive attack on key budget measures, Shorten said Labor will oppose the government’s cuts to universities, its proposed increase in student fees, and the change in the repayment threshold that “hits women, Indigenous Australians and low-income earnest the hardest”. In power, it would reverse the government’s new cuts to TAFE. Labor would also oppose the budget plan to give a tax break for people saving for their first home. Shorten said this was a “cruel hoax”, a joke and an insult, representing just $565 for each first home. He said the 0.5% boost in the Medicare levy – imposed to fund the National Disability Insurance Scheme and to take effect from mid-2019 – would affect every Australian down to an income of $21,000. It would mean a worker on $55,000 would pay $275 extra a year, while someone on $80,000 would face an extra $400. “Labor cannot support making people on modest incomes give up even more of their pay packets,” he said. Labor would only support the levy rise for those in the top two tax brackets. Shorten said the budget “fails the fairness test” and it “fails the generational test”. It was a “budget of big government, higher tax and more debt” and “devoid of values altogether”. He dismissed the government’s measures to protect Medicare, saying that Malcolm Turnbull “only discovers his heart when he feels fear in it”. The opposition leader was at pains to counter the widespread observation in commentary that this was “a Labor budget”. He confirmed Labor would not oppose the budget’s tax on big banks, which has sparked a furious reaction from the banking sector. But it was worried that “the weakness of this government will turn $6 billion tax on the banks into a $6 billion charge on every Australian with a bank account or a mortgage”. The banks knew they could run over the top of this weak prime minister, he said. He said that “if the banks pass on a single dollar of this tax to Australian families then that should be the end of this treasurer, this prime minister and this government”. Shorten said that since budget night Labor had identified $1 billion in measures it would not support, including the $170 million set aside for a marriage equality plebiscite to which the Senate has refused to agree. Earlier, in Question Time, the opposition extracted from the government the fact that the cost of its ten-year corporate tax cut – the first part of which is already legislated – would be $65 billion over the upcoming decade, compared with nearly $50 billion over a decade when announced a year ago. In his budget reply, Shorten said: “This is a recipe for fiscal recklessness on a grand scale. It is a threat to Australia’s triple A credit rating – and therefore a threat to every Australian mortgage holder”. Labor’s plan to close tax loopholes that let big companies shuffle money internationally would deliver $5.4 billion over a decade. Shorten announced that a Labor government would cap at $3,000 the amount people could deduct for the management of their tax affairs. Although affecting only one in 100 taxpayers, this would save $1.3 billion over the medium term. Finance Minister Mathias Cormann called on Shorten to submit his speech to the Parliamentary Budget Office for costing. “If Bill Shorten is serious he needs to come clean with the Australian people about how much bigger the deficit would be over the forward estimates period as a result of the announcements that he has made,” Cormann said. He said Labor’s numbers did not add up and it would put the triple A credit rating at risk. Social Services Minister Christian Porter said that Labor had not outlined enough to fund the NDIS. Bill Shorten used his budget-in-reply speech to appeal to middle Australia.